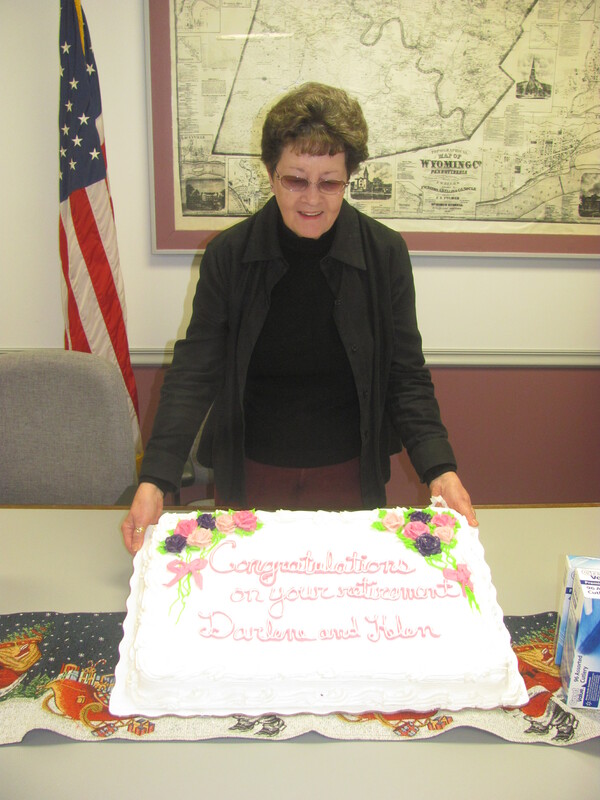 Retiring Deputy Treasurer Helen Montanye was thanked for 30 years of service to Wyoming County during a surprise retirement party at the courthouse in Tunkhannock on Tuesday morning. Dozens of Wyoming County employees at the courthouse took an early lunch break on Dec. 17 and slipped quietly upstairs to the commissioners’ meeting room to surprise Deputy Treasurer Helen Montanye, who will retire at the end of the year. The gathering was also intended as a recognition for Treasurer Darlene Marshall, who did not seek reelection after serving more than two decades in the post. Marshall was not in attendance, however, due to icy road conditions. A large cake decorated in honor of both Montanye and Marshall was subsequently sliced and served to their fellow employees. “I was wondering why you wanted me up here,” said Montanye, who was obviously moved by the gesture. She had been told that Commissioner Judy Mead needed to speak to her. “You know we couldn’t fire you,” joked Commissioner Ron Williams. “You probably wouldn’t care if we did,” Mead remarked with a laugh. “I only have eight days left,” said Montanye. A life-long resident of Tunkhannock, Montanye started working at the courthouse in the late 1970s after 20 years of working in local law offices. She first served as Deputy Treasurer with Shirley Shotwell, then became acting treasurer for a short time. Montanye related that retirement would take some getting used to as she has worked continuously since graduating from Tunkhannock High School in 1958. She is looking forward to doing some renovations on her home and volunteering with the Wyoming County Historical Society. Montanye admitted that she really enjoyed the bookkeeping part of her job, but she will especially miss the camaraderie that she enjoyed with her fellow employees. “The people around here are just great,” she stated. Marshall’s seat will be filled in January by Patty Mead, who won the election for County Treasurer in November.